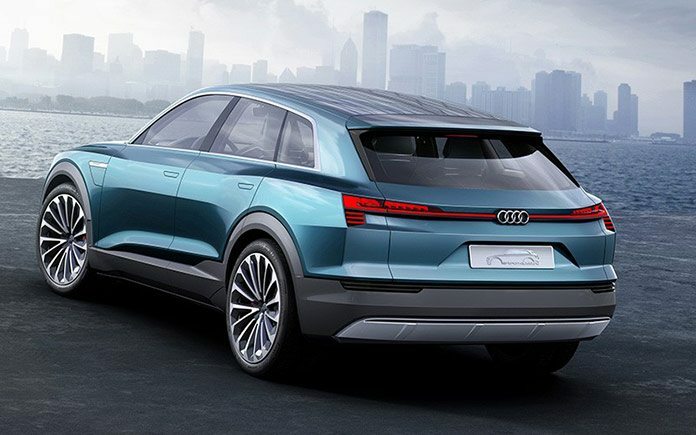 Flow-enhanced design with a drag coefficient of 0.25; powerful, all-electric Audi e-tron quattro drive with up to 370 kW – Audi is presenting the Audi e-tron quattro concept at the International Motor Show (IAA) 2015 in Frankfurt. The car is the company’s statement about the future of electric mobility: It is responsive, efficient and suitable for everyday use. 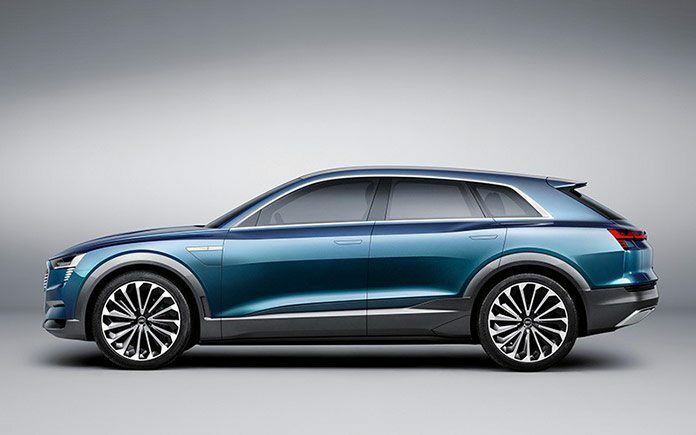 The Audi e-tron quattro concept uses the power of three electric motors: One electric motor drives the front axle, the two others act on the rear. Total output is 320 kW. The driver can even mobilise 370 kW and over 800 Nm (590.0 lb-ft) of torque temporarily while boosting. The concept study thus performs like a sports car. 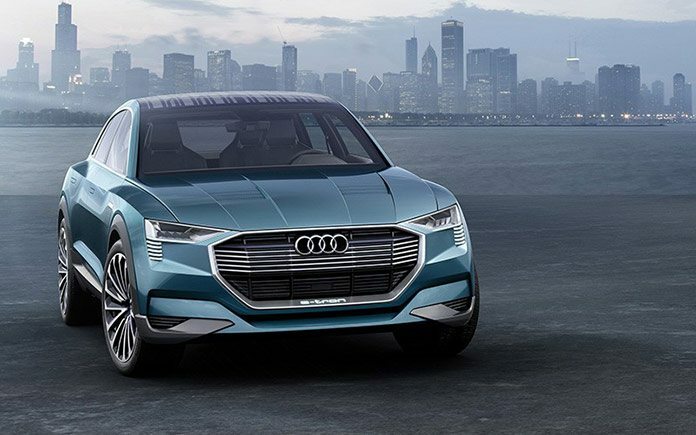 When the driver floors the throttle pedal, the Audi e-tronquattro concept sprints from a standstill to 62mph in 4.6 seconds and quickly reaches the electronically governed top speed of 130mph. The large lithium-ion battery is integrated into the floor of the passenger compartment. 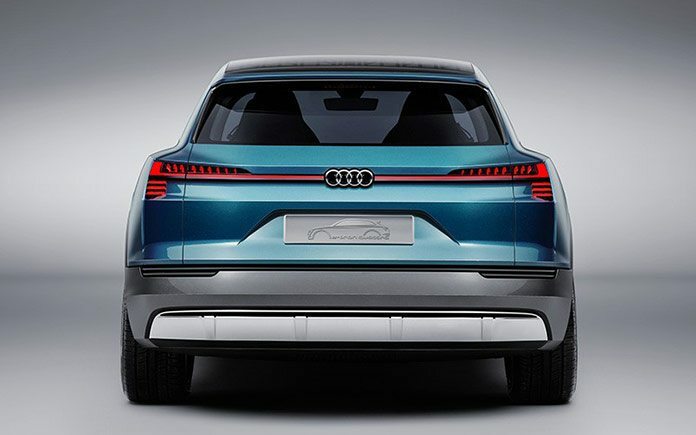 It gives the Audi e-tron quattro concept a balanced axle load distribution and a low centre of gravity – prerequisites for its dynamic handling. The battery’s capacity of 95 kWh enables a range of more than 310 miles (500 kilometres). The Combined Charging System (CCS) enables charging with DC or AC electrical current. A full charge with DC electrical current at a charging point with an output of 150 kW takes just around 50 minutes. As an alternative, the study is equipped with Audi Wireless Charging technology for contactless induction charging. The charging process is very convenient. 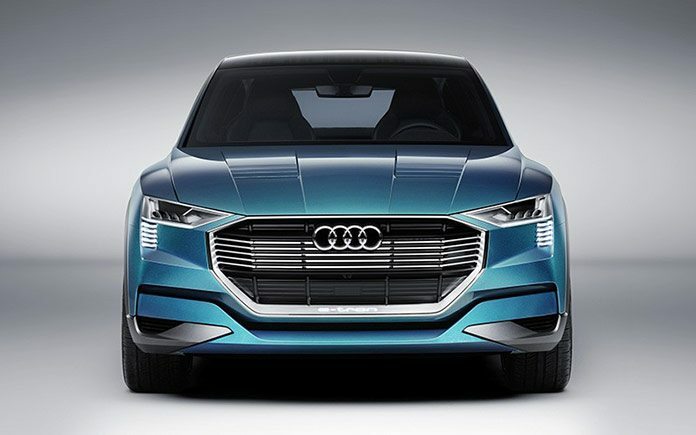 The Audi e-tron quattro concept uses a system for piloted parking that guides it to the proper position at the charging plate. In addition, a large solar roof provides electricity for the drive system battery on sunny days. The chassis also expresses the high-tech character of the concept study. The adaptive air suspension sport, which features controlled damping, lowers the body at higher speeds to reduce drag. The dynamic-all-wheel steering combines a dynamic steering system on the front axle with a steering system for the rear wheels. Depending on speed and the driving situation, they steer either in the same direction as the front wheels or in the opposite plane. 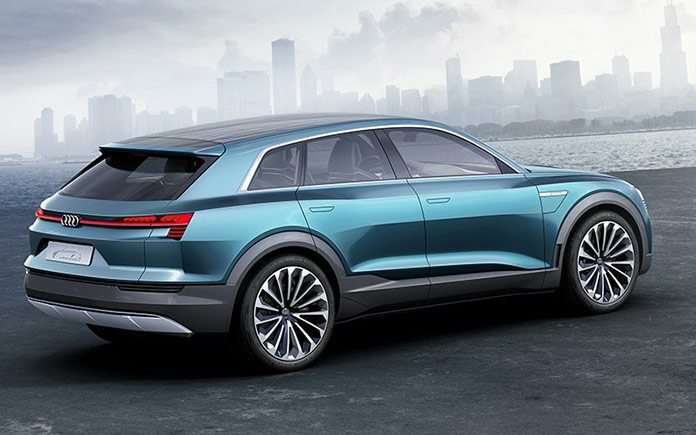 The Audi e-tron quattroconcept thus reacts even more spontaneously and stably, and is also very manoeuvrable at low speeds. All of this contributes considerably to the long range of more than 310 miles (500 kilometres). At speeds of 50mph and above, electrically actuated aerodynamic elements on the bonnet, the flanks and at the rear end direct the flow of air as needed to improve the flow through and around the vehicle. This is one example of the intensive development work in the wind tunnel. Wind noise is low on board the car, and there is of course an absence of engine noise. The fascination of electric driving unfolds in near total silence.